Can you feel the scorching heat of summer? If only I can turn on the air conditioned the whole day I would. At home, I would place left over brewed coffee inside the freezer, add milk and sweeter and I have a sweet and cold treat. Last weekend, hubby and I were in Greenhills shopping center to attend a friend's surprised birthday celebration. 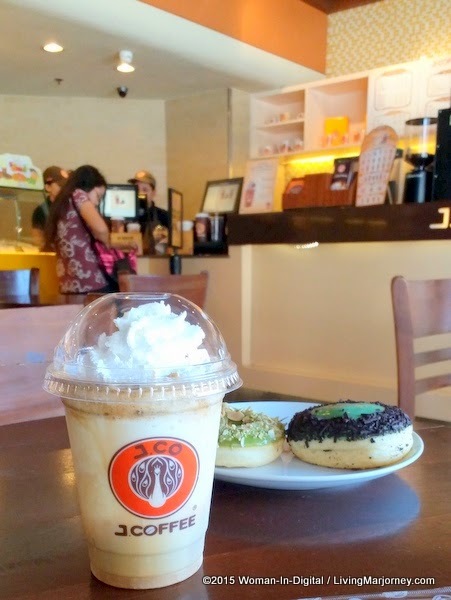 We arrived too early so we decided to grab a cold and refreshing drink at J.Co Philippines. I usually order J.Coccino but the lady at the counter offered their two new drinks White Choco Frappe and the White Choco Espresso Frappe. Vanilla and White Chocolate lovers are in for a treat as J.Co introduces the White Choco Frappe. This new J.Coffee creation has all the components of the perfect summer drink. Infused with vanilla, white chocolate sauce, loaded with hefty white chocolate chunks and served ice-cold. For those looking for an extra boost of espresso, you may opt for the sheer and velvety deliciousness of the White Choco Espresso Frappe.I ordered the one with espresso and it was good and rich, not too sweet. 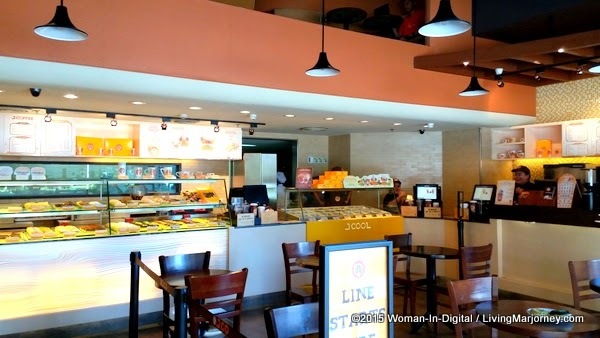 I like the J.Co Greenhills branch, it's very neat and spacious. The staff were very friendly. They even gave me an additional free doughnut, yay!